This edition: Starbucks Mocha Frappuccino, which is made from 16 separate ingredients (some of which have ingredients lists of their own) that we’ve broken down in the exact order they appear on the Starbucks website. 1) Ice: It’s frozen water. Move along. 2) Milk: This ingredient also has another name: Cow juice. 3) Coffee: This is what gives you the jitters. 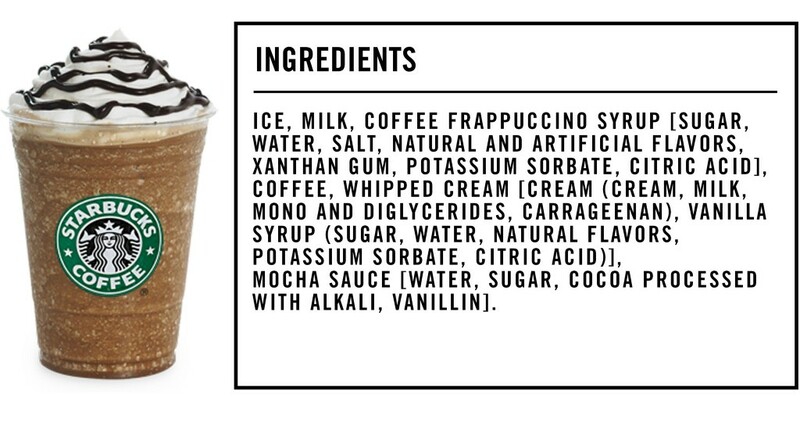 1) Sugar: There’s a whopping 61 grams of sugar (that’s more than 12 teaspoons — or the equivalent of two Snickers Bars, plus a hefty bite out of a third) in a single grande (16-ounce) mocha frappuccino, which explains why sugar shows up three times on this ingredients list. For reference, the American Heart Association recommends men consume no more than 36 grams and women consume no more than 25 grams of added sugar a day (that doesn’t include sugar found naturally in foods like fruits and vegetables either). 2) Water: You drink this. 3) Salt: Saline (salt mixed with water) is sometimes added to sugar-laden syrups to balance out the sweetness with a touch of bitterness. 6) Potassium Sorbate: Potassium sorbate is a preservative used for its antimicrobial properties, which stop the growth and spread of harmful bacteria and molds. A 2010 study published in Toxicology in Vitro found that exposure of human blood cells to potassium sorbate in the laboratory caused DNA damage. That said, a long-term study on humans is still required to decide whether or not we should be worried about consuming this ingredient. 7) Citric Acid: Citric acid naturally occurs in citrus fruits, and it’s often added to foods to extend their shelf life — the acidity kills off microbes lingering within the foods, making it tougher for mold and bacteria to survive and reproduce. 1) Cream (Cream, Milk, Mono and Diglycerides, Carrageenan): There are two unfamiliar ingredients hidden in this cream: Mono and diglycerides (an emulsifier) and carrageenan (a thickening agent). As we learned in our exploration of all 39 ingredients in the Dodger Dog, mono and diglycerides are oftentimes packed with trans fats that aren’t listed on the nutrition facts label, which is incredibly problematic. That’s because trans fats are associated with an increased risk of heart disease, stroke and diabetes, and consuming more than you think you are (because they weren’t listed on the label) could do serious damage to your body. “Carrageenan is widely used in the food industry for its gelling, thickening and stabilizing properties,” explains Dagan Xavier, ingredient expert and co-founder of Label Insight. Some animal studies argue that there’s a connection between carrageenan ingestion and inflammatory bowel disease; however, the FDA lists the ingredient as a Generally Recognized as Safe Substance (GRAS). And more recent human studies take the FDA’s side on this one. 2) Vanilla Syrup (Sugar, Water, Natural Flavors, Potassium Sorbate, Citric Acid): Every ingredient found in this vanilla syrup is explained and analyzed above. 1) Water: Water acts as the base for this sauce. 2) Sugar: No surprise here — just a bit more sugar. 3) Cocoa Processed with Alkali: Cocoa (a powder made from roasted cocoa beans used to give a chocolate flavor to foods) is oftentimes treated with alkali (or, any kind of base) for several reasons: The process darkens the cocoa, reduces bitterness and increases the dispersibility of the powder to ensure even distribution within beverages (like this frappuccino). 4) Vanillin: Vanillin is the main flavor component of cured vanilla beans. It’s added as flavoring. 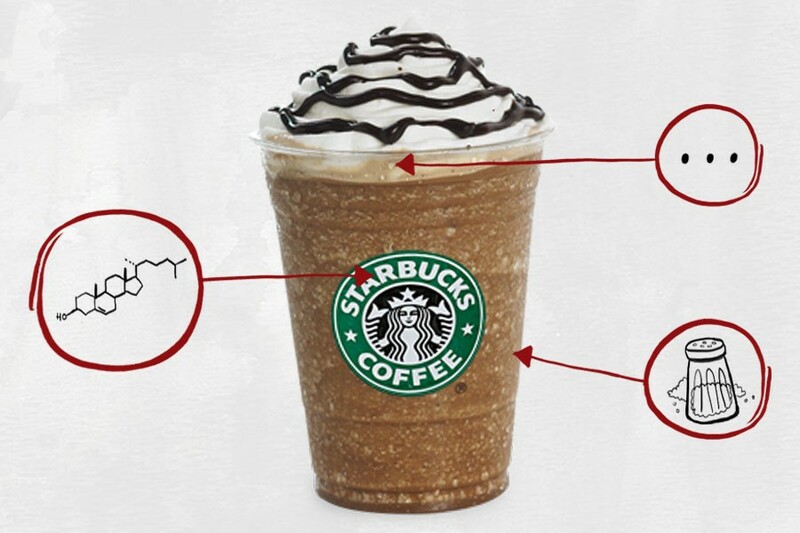 While this mocha frappuccino — unlike some of the other foods we’ve analyzed — doesn’t contain many ingredients that scream cancer or instant death, it’s packed to the goddamn plastic lid with sugar. This, of course, is a huge issue for anyone who grabs a mocha frappuccino for their daily coffee fix: Lots of major studies show that a sugar-laden diet is associated with everything from heart disease to depression. Essentially, while Starbucks somehow managed to trick the world into thinking its mocha frappuccino is a viable alternative to your morning black coffee, let’s be honest: It’s basically a milkshake.